He’s done it again. Piers Morgan posted another controversial tweet on Friday in response to Brad Pitt’s recent GQ interview about his divorce and struggles with alcohol addiction. Just days prior to Mental Heath Awareness Week. The Good Morning presenter weakly attempted to defend himself from the backlash. He claimed he wasn’t referring to mental health, however, his comment publicly highlights an issue. While there are campaigns to push people to seek help and acknowledge mental health issues, when some people do, they are ridiculed and their issues are dismissed. This is an issue feminism is fighting to fix. Studies have shown that men have higher suicide rates than women at 78%. 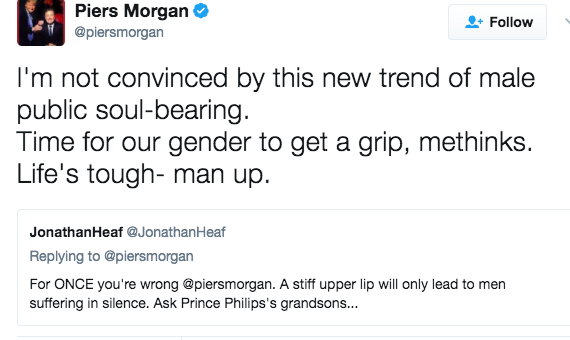 This ‘stiff upper lip’ approach that Piers Morgan speaks of resembles the ideology that “men should be men” and that speaking of emotions and “soul-baring” is only reserved for the women, as he clearly calls upon all the manly men with “our gender.” We hear you Piers, you’re a man that like your men to be men. Although man’s-man Morgan publicly states that he was targeting celebs playing the “victim card”, again hopelessly defending himself, he is forgetting the influence celebrities have on the general public. But Brad Pitt, has a huge following, idolised for his style, career and physique. By doing this he can raise awareness that men suffer from mental illness and show that it's okay to talk to about it. He isn't playing the victim as Piers said, he is proving a point to the average person scrolling through Facebook, who may be dealing with something else. A survey carried out showed that 75% of people said that they felt encouraged to speak out about mental health in response to celebrities doing so, first. And with that, help can be given and problems identified sooner, as well as breaking down a stigma, that Piers is so persistent to keep building up. The problem with this view point, regardless of whether he was referring to mental health, celebs or the “every-man” is that this soul baring, opening up that Piers turns his nose up at-is that it connects to mental health. Everyone has mental health. Some have a good one-some struggle. Through 'soul baring' you can identify those who are struggling. By speaking about how you are feeling, despite gender and old fashioned gender roles, we are breaking down a stigma and can start helping and aiding issues. 1 in 4 people will experience mental health issues and while women are “more likely to suffer from a common mental health problem than men”, male suicide is still higher. 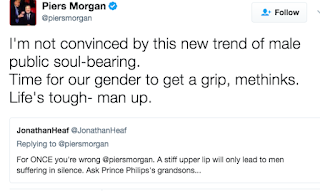 Although research cannot pin point every suicide to a reason, a study by the Samaritans suggest that there are trends of men comparing themselves to a “gold standard”, the ideology that Piers is protesting for, puts pressure on men to reach that standard while they also feel in competition with women. The study acknowledged that with the lack of male dominated industries, and possibly in conjunction with this new wave of feminism, there is a loss of “male pride”. Could this be a reason for the outbursts and tantrums of Piers? While he shares a sofa with a woman, reporting on women’s marches and a female Prime Minister, is he needing to remind himself that men are valid by calling out to other manly men to compare manly stuff? Emotions, however, are not on the agenda for the tv presenter. They don’t come with penises. It is a very old fashioned view for Piers to have and to encourage. Like technology, while society develops, we need to adapt our viewpoints. More people are speaking up about mental health but by doing so, we are “getting on with it”, learning to deal with mental health in the 21st century and with the likes of A listers joining us and normalising it, we, as a society, can start assembling ways to approach and aid, no matter what gender or social status. 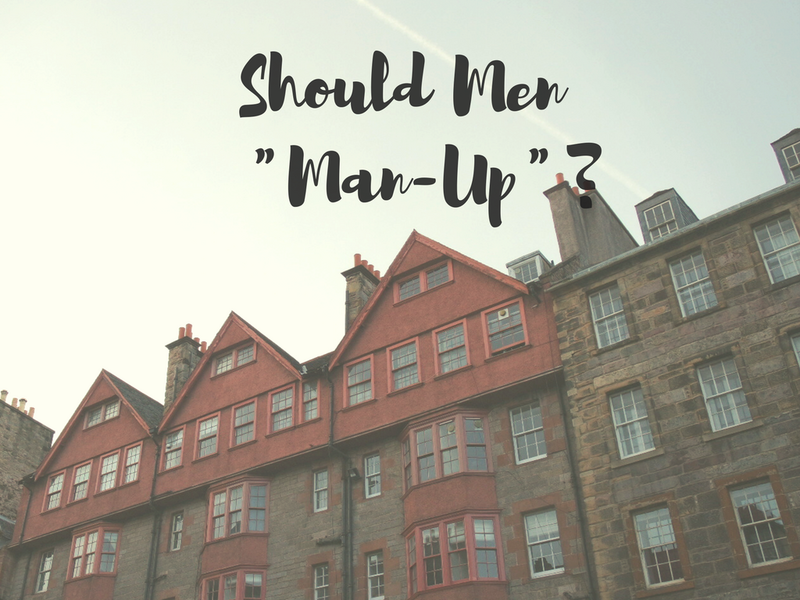 And so to men, I say, "man-up" and speak up.